According to a new market report published by Transparency Market Research titled ‘Air Conditioning System Market ((Product – Split AC and Window AC); (Application – RAC, PAC, and VRF); (End-use – Residential and Commercial); (Distribution Channel – Online and Offline)) – Global Industry Analysis, Size, Share, Growth, Trends, and Forecast, 2018 – 2026, the global air conditioning system market is expected to reach US$ 211,259.4 Mn by 2026, expanding at a CAGR of 4.6% from 2018 to 2026. In terms of volume, the market is expected to reach 190,703‘000 units by 2026, expanding at a CAGR of 3.6% from 2018 to 2026. The market is segmented by regions into North America, Europe, Asia Pacific, Middle East & Africa (MEA) and South America. The air conditioning system market in Asia Pacific is the largest in the world and is expected to grow at a healthy rate over the forecast period. Split air conditioners dominate the Asia Pacific air conditioning system market compared to window air conditioners. Rise in disposable income, changing lifestyle, a hot climate, and increasing construction industry is increasing the demand for room air conditioners (RAC) across Asia Pacific. In the Asia Pacific region, compared to other types of air conditioners such as PAC (Packaged Air Conditioners) and VRF (Variable Refrigerated Flow) system, room air conditioners (RAC) dominate the market. China is the largest market for air conditioner systems in the world. In China, room air conditioners dominate the market. Japan and India are other important air conditioning markets for global air conditioning manufacturers. Global air conditioning system manufacturers are focusing on Asia the Pacific region. In May 2018, Daikin completed and started operation of its first air conditioning plant in Vietnam where it conducts air conditioning assembly, training, and education. The company intends to manufacture room air conditioners and produce one million units by 2020. The company is investing in Vietnam as it expects the Asia Pacific air condition market to grow rapidly in the future. The company already has production plants in Thailand, Malaysia, and India. 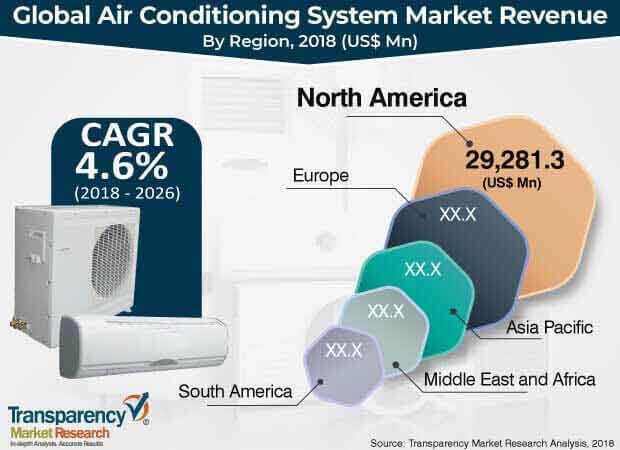 The air conditioning system market in North America holds the second largest share in the global air conditioning system market and is expected to grow moderately over the forecast period. North America is a developed region. Window air conditioners dominate the North America air conditioner market compared to split air conditioners. In North America, room air conditioners hold a larger market share than packaged air conditioners. The U.S. is the largest air conditioner market in North America. Canada is another important air conditioner market in North America. Rise in residential construction both in the U.S. and Canada is increasing the demand for room air conditioners (RAC) in the region. In Europe, room air conditioners hold a major share of the market. Rising residential construction activity especially in Eastern Europe is increasing the demand for air conditioners. Russia is the largest air conditioner market in Europe. Other major air conditioner markets in the region are Italy, Spain, France, and the U.K. Rising demand for high priced VRF (Variable Refrigerant Flow) air conditioners is driving the Europe air conditioning system market. Middle East &Africa (MEA) air conditioning system market is the fourth largest in the world. GCC and Nigeria are major markets in the MEA air conditioning system market. South America air conditioning system market is the smallest in the world. Brazil is the largest and most significant air conditioning system market in South America and the market is expected to grow moderately over the forecast period. The study provides a conclusive view of the global air conditioning system market by segmenting it in terms of product, application, end-use, and distribution channel. In terms of product, the global air conditioning system market has been classified into split AC and window AC. Based on application, the global air conditioning system market has been segmented into RAC (Room Air Conditioners), PAC (Packaged Air Conditioners), and VRF (Variable Refrigerant Flow) air conditioners. The VRF air conditioner systems are also known as VRV (Variable Refrigerant Volume) air conditioners. Based on end-use, the global air conditioning system market is segmented into residential and commercial. Based on distribution channel, the market is segmented into online and offline. The report highlights major companies operating in the global air conditioning system market including Daikin Industries, Ltd., Mitsubishi Electric Corporation, Midea Group Co., Ltd., Samsung Electronics Co., Ltd., Electrolux AB, Panasonic Corporation, United Technologies Corp., Hitachi, Ltd. Sharp Corporation, and Lennox International Inc.